The red calyces, under the flor de jamaica, are the part that is harvested for drying and making into a juice or tea. Hibiscus sabdariffa, also known as Roselle or Flor de Jamaica, is a many-branched shrub that grows well in South Texas. Although native to South Africa, this hibiscus is found in subtropical and tropical gardens around the globe and is used both as a garden ornamental and an important medicinal tea. The plants perform best in full sun. Normally considered an annual, this hibiscus can enjoy several years in our gardens, as long as, we do not experience freezing temperatures for any length of time. This shrub does best in raised beds that are well mulched to retain moisture. They require a regular watering schedule. Depending on the soil type and drainage, a weekly soaking should be adequate during the summer. Propagation can be successful by seed or by cuttings. Hibiscus sabdariffa can form a dense hedge and should be planted 3 to 4 feet apart for best coverage. The red calyces, under the flower, are the part that is harvested for drying and making into a juice or tea. This drink is made in many countries ranging from the tropical areas of Africa, across South America and northward to Central America and Mexico and in most of East Asia. It is commercially grown in India and in China for use as a tea. In some countries, the juice is further reduced into sauces, jellies, wines and pies. 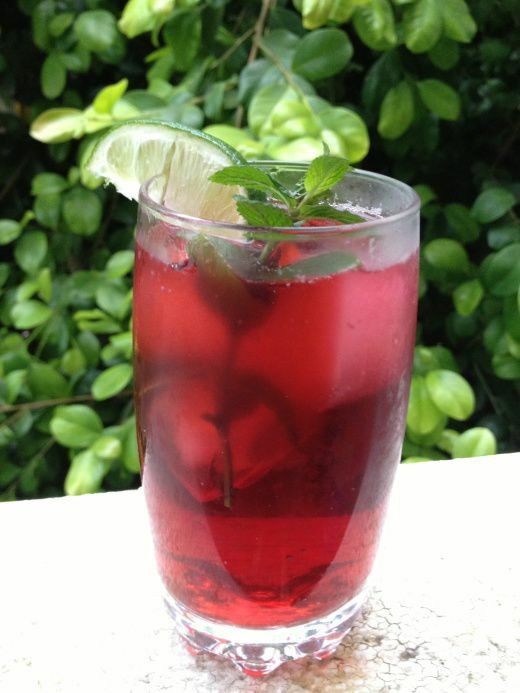 The juice or tea of Hibiscus sabdariffa has been shown to be high in the antioxidant, Vitamin C, as well as multiple beneficial minerals. This tea has been used in several countries for its medicinal effects as a mild diuretic and to relive digestive issues. In recent years, several studies have shown that it is effective in reducing blood pressure, when consumed three times a day. More studies are in the works on other aspects, but the tea’s effect on blood pressure is certainly hopeful. From garden to glass, you can have a drink of Jamaica tea, purchase the dried calyes for making tea, or purchase the plant for growing in your own garden today at the Growing Growers Farmers Market. The Growing Growers Farmers Market is located in Firemen’s Park in McAllen, at the northwest corner of 1st Street and Business 83. This market features vegetables, herbs and fruits, all grown locally, as well as certified 100 percent Grassfed Beef, spring lamb, Gulf caught shrimp and a full array of farm products. The market is open from 9 a.m. to noon. Barbara Storz is a local horticulturist. You can listen to her at 7 a.m. Saturdays on 710 KURV Radio, or e-mail her at bstorz@rcommunications.com.